Korney Ivanovich Chukovsky (Russian: Корне́й Ива́нович Чуко́вский, IPA: [kɐrˈnʲej ɪˈvanəvʲɪtɕ tɕʊˈkofskʲɪj] ( listen); 31 March NS 1882 – 28 October 1969) was one of the most popular children's poets in the Russian language. His catchy rhythms, inventive rhymes and absurd characters have invited comparisons with the American children's author Dr. Seuss. Chukovsky's poems Tarakanishche ("The Monster Cockroach"), Krokodil ("The Crocodile"), Telefon ("The Telephone") and Moydodyr ("Wash-'em-Clean") have been favourites with many generations of Russophone children. Lines from his poems, in particular Telefon, have become universal catch-phrases in the Russian media and everyday conversation. He adapted the Doctor Dolittle stories into a book-length Russian poem as Doctor Aybolit ("Dr. Ow-It-Hurts"), and translated a substantial portion of the Mother Goose canon into Russian as Angliyskiye Narodnyye Pesenki ("English Folk Rhymes"). He was also an influential literary critic and essayist. He was born Nikolay Vasilyevich Korneychukov (Russian: Николай Васильевич Корнейчуков), which he reworked into his now familiar pen-name while working as a journalist at Odessa News in 1901. He was born in St. Petersburg, the illegitimate son of Ekaterina Osipovna Korneychukova (a peasant girl from the Poltava region of Ukraine) and Emmanuil Solomonovich Levenson, a man from a wealthy Jewish family (his legitimate grandson was mathematician Vladimir Rokhlin). Levenson's family did not permit his marriage to Korneychukova and the couple eventually was forced to separate. Korneychukova moved to Odessa with her two children, Nikolay and his sister Marussia. Levenson supported them financially for some time, until his marriage to another woman. Nikolay studied at the Odessa gymnasium, where one of his classmates was Vladimir Zeev Jabotinsky. Later, Nikolay was expelled from the gymnasium for his "low origin" (a euphemism for illegitimacy). He had to get his secondary school and university diplomas by correspondence. He taught himself English and, in 1903–05, he served as the London correspondent at an Odessa newspaper, although he spent most of his time at the British Library instead of the press gallery in the Parliament. Back in Russia, Chukovsky started translating English works, notably Walt Whitman, and published several analyses of contemporary European authors, which brought him in touch with leading personalities of Russian literature and secured the friendship of Alexander Blok. 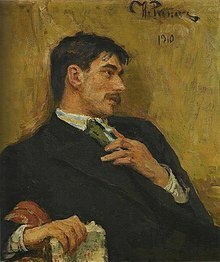 Chukovksy's English was not idiomatic as he had taught himself to speak it by reading and he thus pronounced English words in a distinctly odd manner, and it was difficult for people to understand him in England. His influence on Russian literary society of the 1890s is immortalized by satirical verses of Sasha Cherny, including Korney Belinsky (an allusion to the famous critic Vissarion Belinsky). Later he published several notable literary titles including From Chekhov to Our Days (1908), Critique stories (1911) and Faces and masks (1914). He also published a satirical magazine called Signal (1905–1906) and was arrested for "insulting the ruling house," but was acquitted after six months of investigative incarceration. It was at that period that Chukovsky produced his first fantasies for children. As the 2004 Encyclopædia Britannica put it, "their clockwork rhythms and air of mischief and lightness in effect dispelled the plodding stodginess that had characterized pre-revolutionary children's poetry." Subsequently, they were adapted for theatre and animated films, with Chukovsky as one of the collaborators. Sergei Prokofiev and other composers even adapted some of his poems for opera and ballet. His works were popular with emigre children as well, as Vladimir Nabokov's complimentary letter to Chukovsky attests. During the Soviet period, Chukovsky edited the complete works of Nikolay Nekrasov and published From Two to Five (1933), a popular guidebook to the language of children. As his invaluable diaries attest, Chukovsky used his popularity to help the authors persecuted by the regime including Anna Akhmatova, Mikhail Zoshchenko, Alexander Galich and Aleksandr Solzhenitsyn. He was the only Soviet writer who officially congratulated Boris Pasternak on winning the Nobel Prize. His daughter, Lydia Chukovskaya, is remembered as a noted writer, memoirist, philologist and lifelong assistant and secretary of the poet Anna Akhmatova. Chukovsky's son Nikolai was a military writer, his son Boris lost his life while serving in the army during World War II, and his daughter Maria died in her childhood from tuberculosis. At one point his writings for children were under severe criticism. Nadezhda Krupskaya was an initiator of this campaign, but criticism also came also from children's writer Agniya Barto. Starting in the 1930s, Chukovsky lived in the writers' village of Peredelkino near Moscow, where he is now buried. For his works on the life of Nekrasov he was awarded a Doctor of Science degree in philology. He also received the Lenin Prize in 1962 for his book, Mastery of Nekrasov and an honorary doctorate from Oxford University in 1962. ^ Goloperov, Vadim. "Korney Chukovsky: Odessa's Famous And Also Unknown Writer". The Odessa Review. Retrieved 30 November 2016. 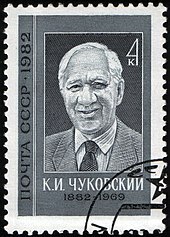 Wikimedia Commons has media related to Korney Chukovsky.